One year ago this month, Pope Francis, in addressing the Union of Superiors General in Rome, announced that 2015 would be a year dedicated to consecrated life. The year would begin on the first Sunday of Advent, November 30, 2014, and end on the Sunday for consecrated life on February 2, 2016 - in effect making it a year of 15 months! Since the Year of Consecrated Life is a world-wide event, you will no doubt be hearing or reading about it wherever you find yourself. About now a question is probably beginning to take shape in your mind; something like: "That is all very nice but how does this affect me in my very busy everyday life?" It is true. If you do not have a personal connection with a sister, a brother, or a priest, or if you did not attend a Catholic school or college/university chances are that this year will not touch you directly but if you are reading this blog you do have some interest in or curiosity about the Sisters of the Order of Saint Benedict. I invite you to take on as a "project" this year to connect with one sister here at the monastery. Sister Karen Rose, OSB, is always happy to hear from people who comment on our Facebook and she is very quick in responding to those who write. 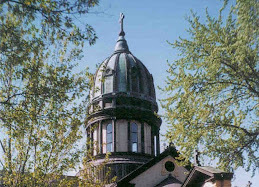 Why not come for a visit if you are in the vicinity of St. Joseph, MN? We offer wonderful hospitality. This is the time of the year when we are grateful for the many blessings we receive from our friends and, so, as a "thank you" we promise to hold you in prayer and would be grateful if you would pray for our fidelity and perseverance in the life that God has called us to.